I love making a whole roast chicken. Lemon and rosemary is always a favorite flavour combo, as is a really garlicy pesto and roasting a chicken stuffed with homemade preserved lemons is to die for. But you want to know the secret to a juicy, moist and flavourful chicken? Buy free-run organic. That’s it. Ever since I saw the documentary, The Corporation, I decided that I could make some small life choices and buying organic free-run chicken would be one such ethical choice. I’ve been happy ever since! It may cost a few dollars more, but it’s worth every penny. So now that you’ve got your plump and juicy free-range chicken, you need to boost that goodness with some flavour. My local grocer had blood oranges dirt cheap, so I bought a whole bag full and decided to use some of that flavour to enhance my chicken. The results were stunning and the gravy I made from the pan juices were incredible. 1. Preheat oven to 400 degrees. Rinse and pat dry chicken. Rub chicken inside and out with the orange quarters. Set aside orange husks. 2. In a small bowl, combine salt, pepper and orange zest. Rub the salt mixture under the skin, inside the cavity, and over the skin. Stuff the chicken with the orange husks, garlic and onion. 3. Add half the olive oil to the bottom of a roasting pan or a rectangular baking dish. Swirl about the carrots and potatoes in the olive oil and sprinkle with some salt, pepper, and rosemary. Move the vegetables to the perimeter of the pan. Add the chicken breast side up in the middle and drizzle the leftover olive oil over top. Roast chicken in oven for 1 hr or until juices run clear. Serve. My oven is on the fritz. I wonder if I can use my slow cooker for this dish, without getting the ‘boiled chicken’ effect? p.s. Why am I always the first to respond? I hope you don’t mind kickpleat. Yum. I love the blood orange idea! I know only buy the free-range organic chicken….it does taste better! lemon rosemary is also one of may fav’s for roast chicken…I love the idea of using blood oranges…can’t wait to try it! Ohhh my God! I have tried and tried (just twice, mind you!) and have drastically failed at making the perfect golden roast chicken. Yours looks to die for! Yummmmmm…. is it wrong to be salivating over roasted chicken at 10 in the morning? Thanks for this recipe, I’m definitely giving it a whirl. Joanne, I wouldn’t trust a slow cooker for roast chicken! And I certainly don’t mind you posting! If you didn’t, I’d wonder what’s going on! Thanks Hag & Rachel, the blood oranges worked beautifully! Meena, I can’t belive you’ve had trouble with roasting chicken! Seriously, you have to buy free range birds…they can withstand crazy oven temperatures and are really juicy and delicious! Plus, you’ll feel better about your purchase. If you try it, let me know! Claire, it’s definitely okay to salivate over chicken in the early morning. I’ve had some pretty crazy cravings at strange times brought on by photographs! mmmm- this is great- i have been really thinking I want to try this- never have! and this looks scrumptious!! I am definitely making this this weekend. I had forgotten that blood oranges are in season–yay! And I just saw a recipe on Epicurious for couscous with zucchini that will be perfect with it. And you’re right–the quality of the chicken makes all the difference in the roasting. i once made it with lime, chili and ginger and that was dead tasty. i totally agree with you about buying organic birds, it makes all the difference. 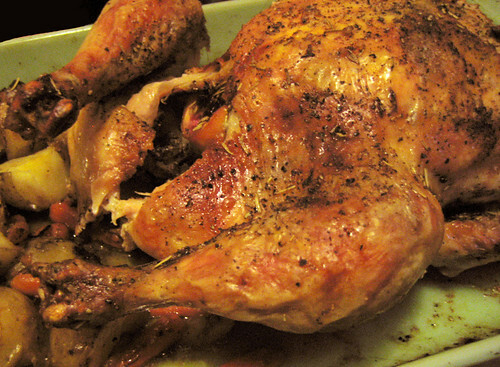 tania, say it ain’t so…you’ve never roasted a chicken? well good luck & enjoy! mmm, amy, couscous & zucchini would be a great side dish to this meal. yum! so true, amanda! i’ll definitely try the ginger, lime and chili seasonings next time. we made this for dinner just this saturday and holy crap, was it fantastic. we couldn’t find blood oranges, but whatever those p-named ones we found at whole food were they were fantastic. it was such a delight to have a little hit of orange with every bite of super-juicy chicken. thank you so much! yum. I have never roasted a chicken but totally want to make this for someone. What exactly am I to do with the orange? Danielle, the recipe says to rub the chicken all over with the orange quarters and then once the bird has been spiced, stuff the cavity with the orange husks. Easy! I’m wondering how this would do with fresh rosemary since I have a plant. Stephy, it would be totally great with fresh rosemary – just add a bit more!